Our engineering team has developed a precision benchtop instrument, the E316 Electrometer Amplifier, for measurement of very low electrical currents from as little as 0.1 pA up to 19.999 μA. The instrument consists of two main functional modules: of a current-to-voltage converter module, and of a digital voltmeter (DVM) module. While the DVM displays the measurement value on a 4.5 digit front panel display, the analog voltage itself from the converter is also available for output, allowing connection of a data logger or digitizing equipment. The E316 provides excellent dynamic range throughout the wide scale of input currents due to the low input noise level - from 0.1 picoamper to 19.9 microampers, divided into five sub-ranges. The input circuitry is isolated from both the AC power grid and the ground potential, eliminating unwanted noise paths. The instrument is applicable as a photodiode transimpedance amplifier for measurement of low currents produced by photoelectric sensors, as well as other similar sensors and circuits. For detailed technical information, please review the E316 Specifications page. 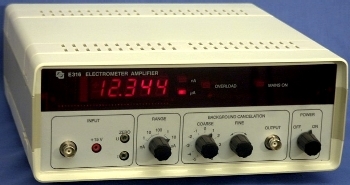 NOTE: E316 Electrometer Amplifier replaces the earlier model, ELV-1.